For as long as I can remember I’ve always been a plural person, never a singular. I’ve nine needlework projects on the go at the moment; three cross stitch designs, three needlework cushions, two needlework glasses cases and a tapestry. I’m also making four skirts and three summer blouses. In the loft is three knitting machines. I’m busy crocheting another blanket and have just bought some wool to start knitting a blanket. I’m the same with books. I never just read one at a time. Currently I’m reading ‘1939 The Last Season’, ‘The Dastardly book for Dogs’, ‘How we lived then – A history of everyday life during the second world war’ and ‘Mansfield Park’ by Jane Austin. I’ve got two PC’s - one is my main computer and the other is for games, plus two laptop computers. I’ve also got two MP3 players. One is purely for music, while the other is for poetry which I listen to in bed when I can’t sleep. A third will be joining them later in the year which will be for audio books. In my work room I’ve got three radios - a CD radio, a DAB radio and an internet radio. I do though have one thing which is singular – a husband!!! 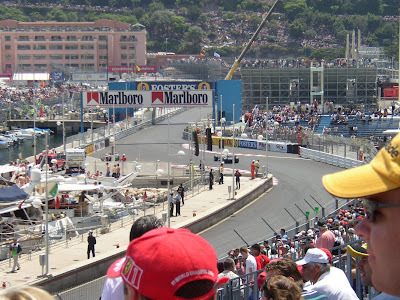 Six and a half years ago we decided to go to the Monaco Grand Prix. We looked through the various motor sport travel company brochures offering packages to the Grand Prix, but there were so many options to choose from. We decided that we would prefer to stay in Monte Carlo as apposed to staying in Nice and travelling into Monaco for qualifying and the race. Our next decision was where to stay. Monaco isn’t a cheap country so naturally all the hotels were expensive. 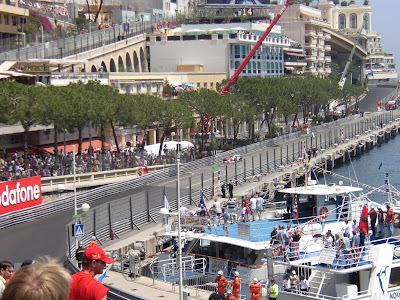 Once we had chosen a hotel, we then had to think about the cost of the race tickets (£420 each for the full weekend), plus on top of that was the cost of eating and drinking in Monaco. We estimated that the total cost would be pretty eye watering…. While flicking through the brochures again something caught John’s eye. It was a five day Monaco Grand Prix cruise with the cruise line Silversea. As well as it being a six star cruise ship, all food and drinks were included, and no tipping was allowed. On the Friday night there was to be a special Grand Prix dinner party taking place at the Monte Carlo Grand Hotel, with the dress code being black tie for men and Bugatti Blue cocktail dress for ladies. Also on board would be Sir Stirling Moss and Murray Walker. Plus race tickets for the entire weekend in a grandstand with a superb view thrown in. As you can imagine we were drooling over this but expected it to be extremely expensive. To our complete surprise the cruise package was actually cheaper than doing it independently. So of course we just had to choose the cruise option ! ! ! While we were walking back to the ship after the race we both said that although we were having a fabulous time, the race actually got in the way of us enjoying the cruise experience. 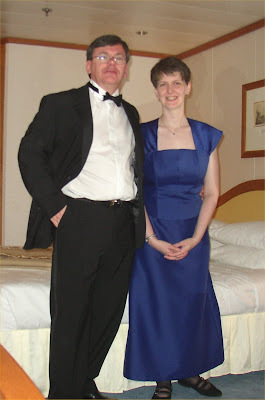 So we decided that the following year we would go on a Silversea cruise, just to see what it was like without the race. We’ve now done four…. Last year we bought a freeview receiver with built in hard disk recorder. The concept is excellent. No more worrying about video tape, watch the beginning of a programme while it’s still recording, and stop live television when the ‘phone rings. There was just one problem. Back in July it decided to cry enough and had to be replaced. The original machine had an 80Gb hard disk and the replacement has 160Gb so we couldn’t grumble. Except that just recently it locked up and nothing would get it going again. We called the helpline and were told to bring it in for replacement. You can guess where this is going. Yep, the second replacement had a 320Gb hard disk. Now if only I can get back my lost recordings of last years Tour de France. ….or I will shortly when I become a spectacle wearer. This morning we both went for our two yearly eye test. As usual John needed a new pair, which sadly meant parting with over £400. Normally I’m sent on my way being reassured that everything is fine. Not this time though. As soon as the little optician man dropped a lens in front of my eye, and the letters become sharper, I knew I was joining the ranks of spectacle wearers. It’s not as bad as it could have been because I only need them for reading or other close up work if my eyes are tired. Boots had a buy one get one free offer, so I now have a pair for upstairs and a pair for downstairs.